Introduced budget bills are taken up and amended by the General Assembly. Amendments are proposed at several different times in the budget process. Member requests are submitted by legislators at the beginning of the process. Those amendments that make it out of committee are referred to as Committee Approved. Floor Request and Floor Approved amendments happen while the legislative body is in session. The Conference Report contains those amendments that both the House and Senate have approved. Governor’s Recommendations occur after the Enrolled Budget is submitted for executive approval. Each of these categories is referred to as an amendment stage. Most budget bills have some, but not all, of these amendment stages. 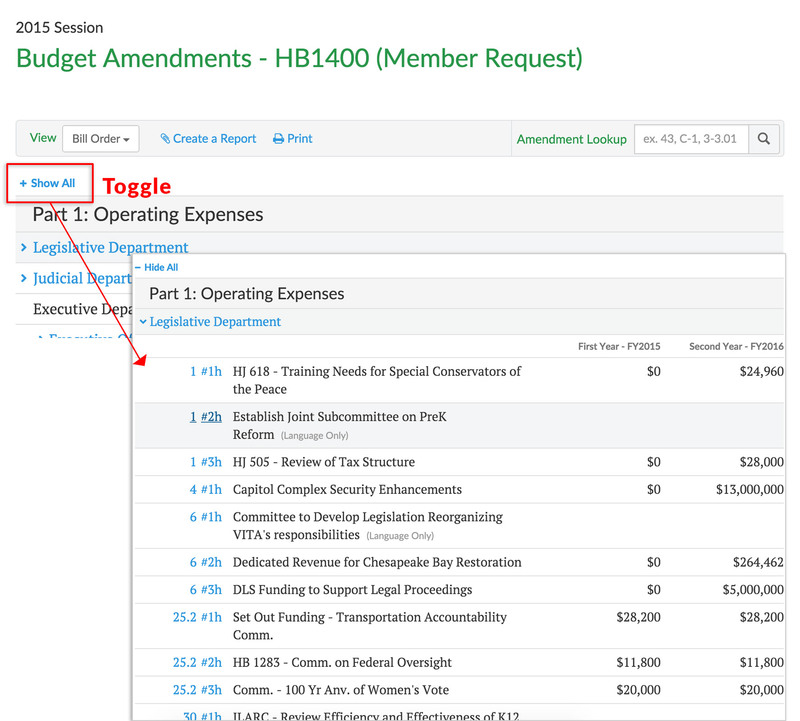 Budget amendment navigation is similar to that of the budget bill. Amendments are organized by biennium and listed under a bill number. 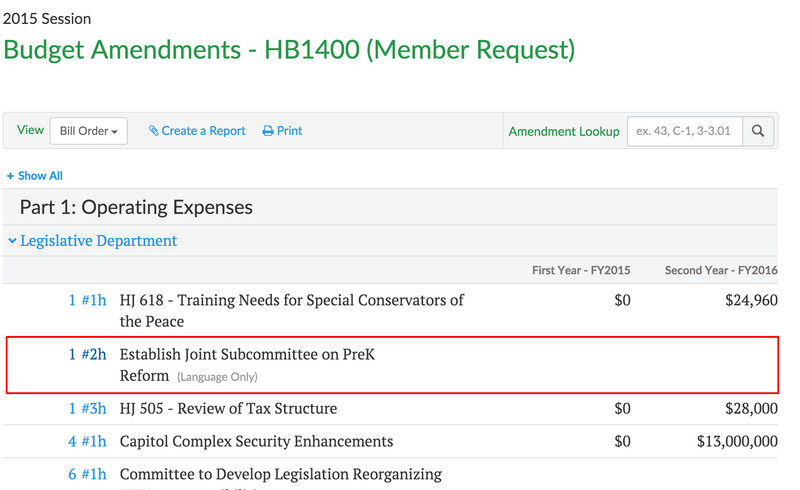 Click on an amendment stage to see all amendments for the selected bill during that stage. Amendment stages include Member Request, Committee Approved, Floor Request, Floor Approved, Conference Report, and Governor’s Amendments. Each amendment is drawn to a specific budget item as numbered in the budget bill, and is numbered accordingly. For example, with the amendment numbered 1 #2h, 1 indicates that item 1 is being amended, and h indicates that this is a House amendment (as opposed to s for Senate or c for Conference). Governor's amendments or vetoes, when linked under the bill, are simply listed by item number, in a text document. The details of the budget amendments are organized into a table of contents. Click the + Show All link to see all the budget amendments for the bill and stage you are viewing. You also have the option to toggle the view on a single category by clicking the heading link. When the amendments are hidden, the heading will start with the > symbol. Once the amendments are shown, the heading symbol will point down. You will see a summary view for the amendments. Click the amendment number link to the view the details for the amendment. 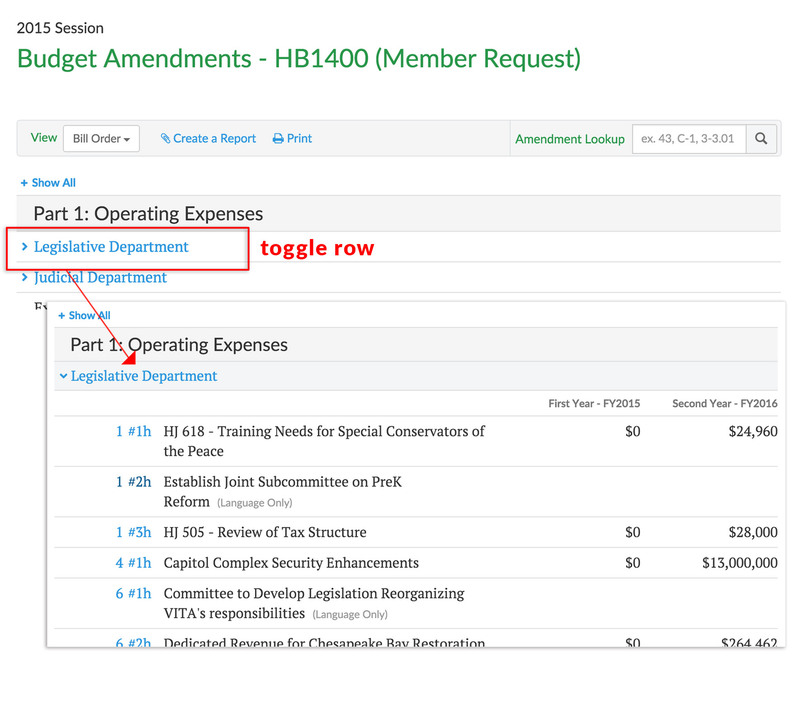 You can change the way the budget amendments are organized in the table of contents with the View drop-down. 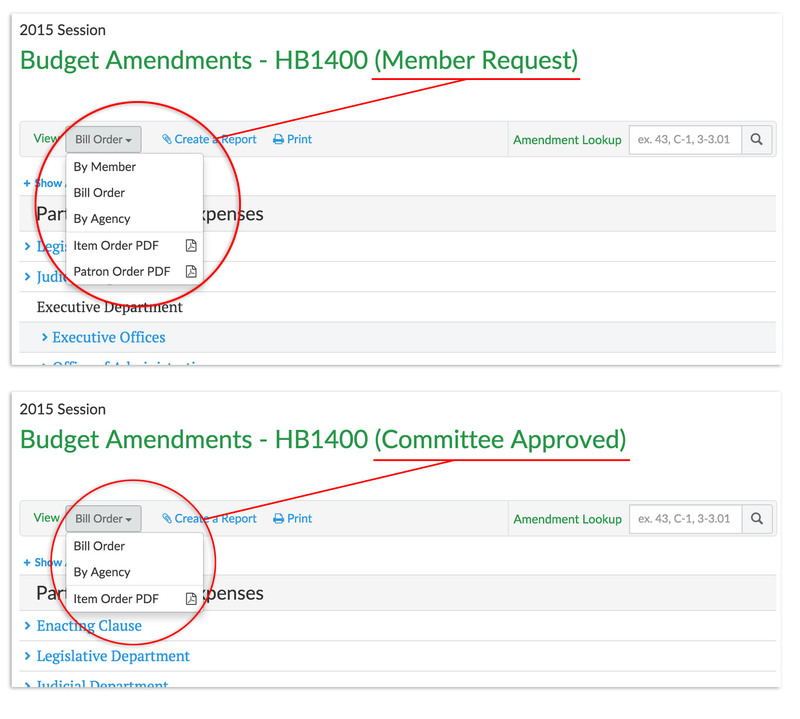 There are two viewing options available for all the stages of the budget amendments: Bill Order or By Agency view. The Bill Order view groups amendments by the part of the budget that they propose to amend: Operating Expenses, Capital Projects, Miscellaneous or General Provisions. The Agency view sorts amendments by the Agency affected. The Member Request stage also includes a view By Member. 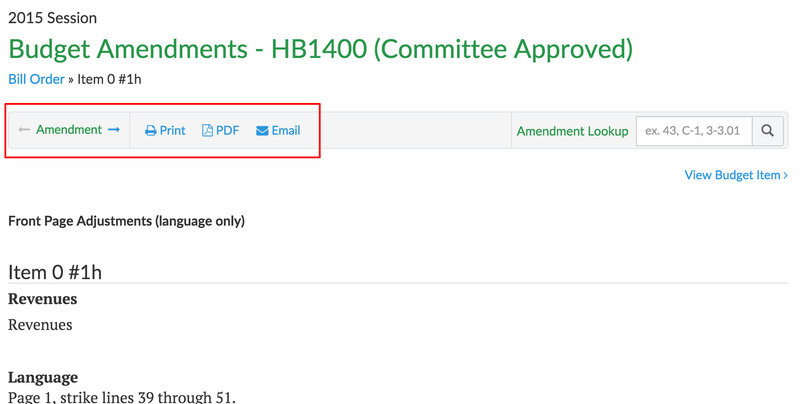 There is also the option on this menu to view a pdf of all amendments in the selected stage in bill order. There are several options available once an amendment has been selected: view previous or next amendment within the view, print the amendment, create a PDF of the amendment, or email the amendment.